The 13th Precinct saw a 35 percent spike in crime over the last month, mostly in burglaries and grand larcenies. 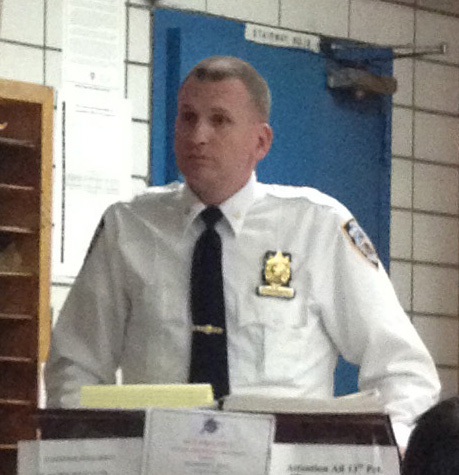 The stats were revealed by Deputy Inspector Dave Ehrenberg at a meeting of the 13th Precinct Community Council on Tuesday. However, Ehrenberg, the precinct’s commanding officer, noted that part of the reason for the increases is because of the comparison to the low numbers last year due to Hurricane Sandy. The increases in burglaries are mostly due to residential incidents and, noted Ehrenberg, there were no cases of forced entry in the residential burglaries that had occurred. “They’re getting in through patios, roofs and doors from adjacent buildings,” he said, adding that the crimes are easier to prevent than they are to solve and he reminded residents to lock their doors as well as windows, especially if they lead to a fire escape or balcony. There has been an increase in grand larcenies as well and an especially large increase in what the NYPD refers to as “picks and dips,” which is when someone is pick-pocketed or their property is left out somewhere and then stolen. Cell phones and wallets are the most commonly stolen items in these cases and Ehrenberg said that it isn’t necessarily the newest model of cell phones that are getting stolen so regardless of how new the phone is, residents should still be vigilant. Because these crimes are also difficult to solve after the fact, Ehrenberg advised that people be careful with their bags while on the subway and walking down the street. The increases in grand larcenies have also been due to victims leaving their property out and having it stolen. Ehrenberg said that there have been three cases in the past month of this happening in the Starbucks on Union Square West, with all items worth more than $1,000. 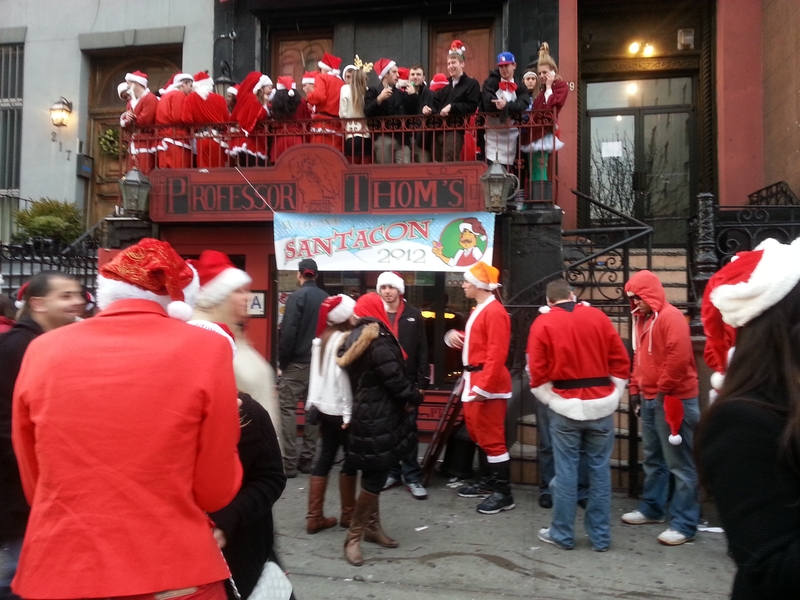 Meanwhile, residents at the meeting have already begun expressing concern about the impending arrival of SantaCon, the annual pub crawl that often results in excessive drunkenness in the neighborhood starting in the morning and escalating throughout the day, and which will take place on December 14 this year. A resident of Stuyvesant Town said that he looked at the website and noticed that there are already 12,000 people who have signed up to participate. Ehrenberg said that police are already planning on increasing their presence on that day and while they try to speak to bar owners and discourage them from participating, he noted that this is difficult since the bars do make money from the event. At the beginning of the meeting, Ehrenberg awarded Officer John Dziedzic as Cop of the Month for arresting a man for mugging a 16-year-old deaf boy in October. The boy was on his way to school at PS 347 on East 23rd Street when he was mugged. Ehrenberg said that the officers needed the assistance of two interpreters to communicate with the boy for a description of the man but when they went out with the description, Dziedzic followed him and an arrest was made. He was charged with robbery as well as grand larceny for an incident last year in which he had targeted the same boy. Last month’s community council meeting was full of residents from buildings on East 28th Street who had complaints about a homeless man who had been causing problems in the neighborhood. As Town & Village reported earlier this month, Ehrenberg said at Tuesday’s meeting that the man, Anthony Lawrence, had been arrested and formally indicted on two high charges, attempted robbery and assault. Ehrenberg noted that his next court date would be November 26 and cops have been working closely with the District Attorney’s office on the issue.